I am Janne, the Wheat Free Woman. I was diagnosed with a wheat allergy thirty years ago and I love cake (and all things sweet) so I had to learn by experience how to make the food I liked gluten and wheat free. I love good food and I don’t want to compromise on enjoying good quality tasty food just because I am intolerant to something. I hate the feeling of being different and fussy that having to request gluten free food can sometimes entail. I believe that the more information and recipe ideas we can share, the simpler we can make it for people to make gluten free food and the more encouragement we can give those who get it right the more “normal” gluten free will become. Although the amount of information available has improved dramatically over the last few years I know from my own experience and from the many gluten free’ers I have met through my business, that what we need is clear straightforward information on how to make and buy really tasty gluten free and wheat free food. And it is not just those of us who need gluten free and wheat free food ourselves. There are also those catering for gluten free’ers, whether regularly or as a one-off event like a dinner party. They often fear making their family member/friend ill and they lack recipe ideas. They need information that helps take the fear out of cooking gluten free and makes it simple. I really believe that if we can get the quality and taste of the food right everyone will want it. That way people can use the same products for everyone and the experience for me and others like me will improve beyond recognition. 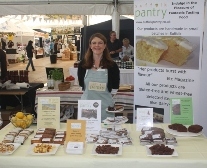 After relocating from London to Suffolk I started my own gluten free cake business, Suffolk Pantry in 2010. Selling my own tasty cakes and cookies, handmade with the best ingredients, at Farmer's Markets and the Aldeburgh Food Festival. A highlight was winning a Great Taste Award for my Dark Chocolate Brownies with Cherries. The biggest thing I learnt from my cake business was the huge demand for recipes and information for gluten free living. I realised just how much I knew from my thirty years of experience. I loved sharing my experience as a speaker at events, being interviewed on the radio and chatting directly with customers. This led to launching How2bglutenfree in 2012. Our aim is to share recipes and tips for making delicious tasting food that just happens to be gluten free. Whether you are living gluten free full-time, trying out it out for health reasons or occasionally catering for friends and family.